"Ranchers and construction workers from riverside Mexican villages are trained in the U.S. by the @nationalparkservice to help fight #wildfires in Texas and other states. The members of one Mexican firefighting team, known as Los Diablos, are a burly, gregarious lot, who wear biker bandannas under their helmets. None take themselves too seriously. 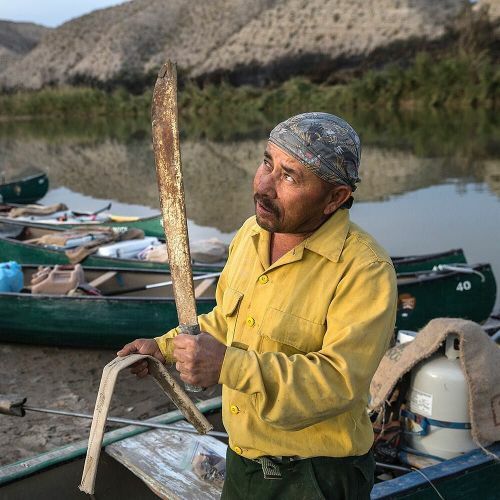 @tamirhasacellphone photographed Jesús Galindo, a Los Diablos firefighter, who joked that his machete once belonged to Pancho Villa. Along with American firefighters, conservationists and park rangers, Jesús and his team traveled to one of the biggest sections of giant cane on the American side of the Rio Grande — a mile-long thicket, where many stems stood more than 15 feet tall. Their goal: to use controlled burning to kill the cane, a tall bamboo-style grass that grows in dense patches on both sides of the river. This #nytweekender, we'll be sharing more of @tamirhasacellphone's photos from a 3-day journey in @bigbendnps with the American and Mexican fire crew." By nytimes on Instagram.